I was pretty excited about the Hardware Store Week challenge. Lowe’s is my absolute favorite store, followed by Home Depot for a close second. It’s so fun to walk around the aisles and try to see a new use for all of those supplies. I had seen vintage turbine fans turned into light fixtures on some pricey websites. All that I had seen were well over a couple hundred dollars. I loved the look, but couldn’t justify the price. I needed a light fixture for my craft studio and I had a feeling I could DIY my own version. 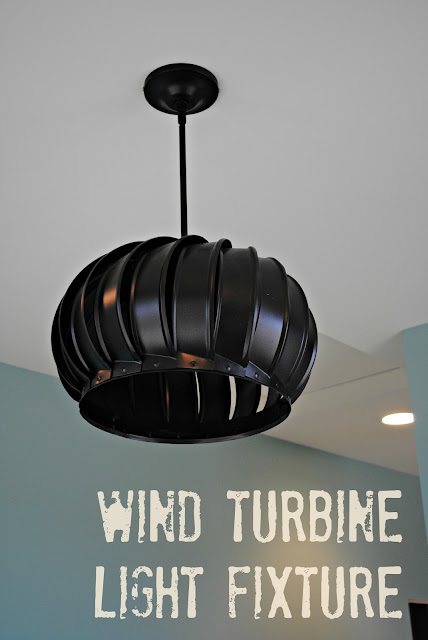 I started with a wind turbine exhaust fan from Lowe’s. It was about $35, but I have since seen a few on clearance at my local Lowe’s. I think these are mainly used in attics or barns. They came in a couple of different colors, but I planned on painting mine, so I wasn’t picky. Here’s what she looked like after taking her out of the box. There are basically two pieces. 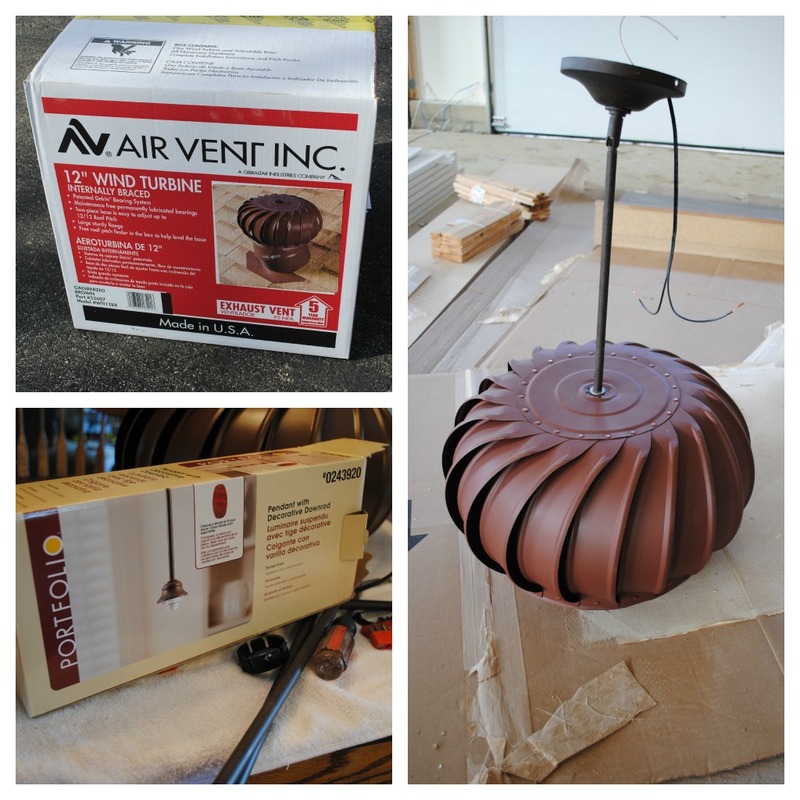 In addition to this fan piece, there is a tube type of piece that the fan sits on. I didn’t use any part of that piece for this project, but maybe I can find a new use for it in the future. At this point, my dad and I just started taking pieces apart. We were trying to get all of the “extra” pieces off so that we were left with just the fan blades for the light fixture. This little plastic piece was at the top, holding the apparatus that allowed the thing to turn. We pried it off with a screwdriver. We started unscrewing pieces, trying to cause the least amount of damage. We still wanted it to be structurally sound, but I didn’t want all of the inner workings. They would be in the way of my pendant light. We ended up doing more work than we had to. In the end, we just took some metal snips and cut the three support bars that were holding all of the pieces in. Once those were cut, we were left with the outer shell which was going to function as the shade for the fixture. At Lowe’s, I picked up one of the pendant light kits. It was sold in the small endcap area with different types of glass shades so that you can mix and match to make your light fixture. I unscrewed the metal rod that covers the electrical wiring and threaded this part of the fixture up through the bottom of my shade. Then, I had to thread the wiring back through that metal rod and screw the rod back into the fixture. Basically, think of it as sandwiching your shade (the exhaust fan) between the light socket and the metal pendant rod. Here she is, all ready for paint! I gave the whole thing a couple of good coats of oil rubbed bronze spray paint, let it dry well, and it was ready to go! The light fixture now hangs in my studio and casts the prettiest design on the ceiling when the light is on in the evenings. It’s the first thing that gets a comment when people walk into that room. Everyone wants to know more about it. Amazingly done! I’m crazy for industrial light fixtures like this one.